A June summer’s evening, on the Sussex Downs, in 1925. Mary Russell and Sherlock Holmes are strolling across their orchard when the telephone rings: an old friend’s beloved aunt has failed to return following a supervised outing from Bedlam. 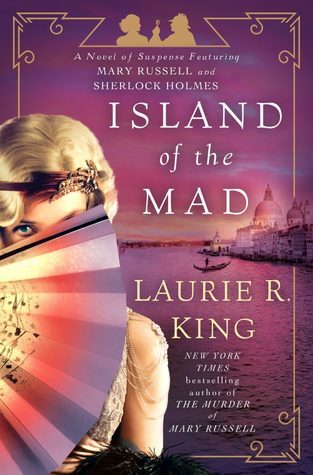 After the previous few weeks–with a bloody murder, a terrible loss, and startling revelations about Holmes–Russell is feeling a bit unbalanced herself. The last thing she wants is to deal with the mad, and yet, she can’t say no. The Lady Vivian Beaconsfield has spent most of her adult life in one asylum after another, yet he seemed to be improving–or at least, finding a point of balance in her madness. So why did she disappear? Did she take the family’s jewels with her, or did someone else? The Bedlam nurse, perhaps? The trail leads Russell and Holmes through Bedlam’s stony halls to the warm Venice lagoon, where ethereal beauty is jarred by Mussolini’s Blackshirts, where the gilded Lido set may be tempting a madwoman, and where Cole Porter sits at a piano, playing with ideas.. It didn’t take much to have a woman parked in an insane asylum back in 1925. Standing up for yourself, would be called hysteria. Being gay or wanting to be independent or a million other reasons that showed just how few rights women had. When Vivian, the aunt of Mary’s friend, goes missing after a week-end at her half-brother and guardian’s home, it becomes a race to find Vivian before her greedy and mean brother can. From the dark gloominess of Bedlam to the beauty and freedom of Venice, they follow their clues. Sherlock and Russell are so good because they have entirely different ways of investigation and those two ways gel quite nicely. With a lot of help from some famous and even not so famous people they may have come up with a plan that will protect Vivian and let other women live their lives on their own terms. I didn’t know Sherlock was still being written into stories. Doing well! Yes, poor Sherlock will never rest in peace I’m afraid.